July 25, 2018 January 25, 2019 ~ Mike K.
This ended up being an impromptu third escape room for the night, primarily because it was closing soon. We weren’t sure when the next time we would be down in Lynchburg was, so we asked if they would stay open late for us. They said yes, and we did a third room. That was the only easy part of the experience. The theme of this room was also something a little bit haunted, and as much as I love anything horror (because I never really ever jump at anything scary), that just made it all the more more appealing for us to squeeze in at the end of the night. On our trip to Lynchburg, we fully expected to do two rooms here at One Way Out. Both experiences were really good, and we were talking with the manager, Kristina, after the last room we did (The Experiment). She was telling us about their other rooms, and we said we’d have to check them out on our next trip. Once she mentioned that The Shuttered Room was closing at the end of July 2018, we bemoaned the fact that we wouldn’t be back by then. While we were doing our wrap up on The Experiment, Kristina talked to the other manager and they offered to let us do the Shuttered Room while they were closing down the other rooms. So, of course we had to do it! We paid up, and started the pre-room briefing. I was personally excited to do this room. I love rooms that deal with the paranormal or the supernatural, so combine that with a murder mystery, and we’re in for a treat. The old man that lived in the house, having been a recluse for a number of years at the end of his life, passed away. With no family to hand the house down to, it went to auction and was purchased. The family that purchased it was fixing it up and found this small closed-off room in the basement. When they went to renovate it, they found many weird disturbances occurring, so they stopped the renovation and called some paranormal investigators (us) to investigate and figure out what was going on and how to stop it. You don’t have any details to what happened prior to entering the room, so everything you find relating to this murder mystery or whatnot is found in the room on the fly. Rating: 7.5/10 You are a team of paranormal investigators who are called in to investigate a hidden room discovered in the basement of an old house that was recently purchased by new owners, who have decided to do a few renovations. Strange disturbances are driving the family crazy, so they called you in to see if you can figure out what is going on. This room was a little different in that the objective was to actually solve a murder. There was no extra room to be found, no other key to unlock the exit door, etc. As you progress through the room, you’ll find all the bits you need to solve the murder and you had to actually solve it so the restless spirit would leave the house and everything would go back to normal. It’s definitely something we’ve seen very rarely, so it’s refreshing to actually be able to do something different for a change. Not just solve a bunch of puzzles and figure out how to leave a room, but actually do something useful in the room. Rating: 8/10 Relatively simple: Investigate the hidden room that you uncovered and unlock the murder mystery that may be connected to the recent haunting that has been going on. I may not have given this the highest rating, but it’s – in part – due to the design of the room. You figure out more to the story during your investigation that leads you to how to solve the mystery that is plaguing the new owners. There was quite a bit going on in this room considering how small it was and how succinct the story was. It started off by finding the key that the homeowner dropped in the basement room, and that set the escape in motion. There were a few combo locks, some physical puzzles, and some…equipment. There were some interesting puzzles in the room; things we’ve seen before but with their own unique twist. Yes, we say that a lot, but the sign of a good escape room is that you can take a tried-and-true puzzle, tweak it just enough to make it different, and have it work in your favor. They did a good job of that with some of the puzzles here. Probably my least favorite puzzle in the room had me wondering around in circles for at least 5 minutes. If I could do the room again, I would make Mike do it. I digress. This room had a lot of really cool puzzles that are all well hidden in the design of the overall room. We saw a really cool take on a standard puzzle, and also saw a type of puzzle that we’d seen elsewhere that you need a piece of equipment to solve… but the puzzle was so well blended into the room, we had to ask for a clue to figure where to use the equipment to solve it. I know I’m being vague, but this is another example of just because you know what you need to do, doesn’t mean that you can easily solve it when you encounter it in the room. I also love ciphers, and we weren’t disappointed in this room. There was an interesting spin on this puzzle here as well. All I”m going to say is that you need to be observant and look everywhere… even in places you may have looked before. The main thing that hung us up was that one of the puzzles you solve later in the room is hindered by a puzzle you solved earlier in the room. I spent a good 5 to 10 minutes doing something completely useless because I didn’t recognize this fact beforehand. I blame it not on lack of observation, but lack of recall. When we started this room it was something like 11: 30 at night and I blame us all for being kind of tired. 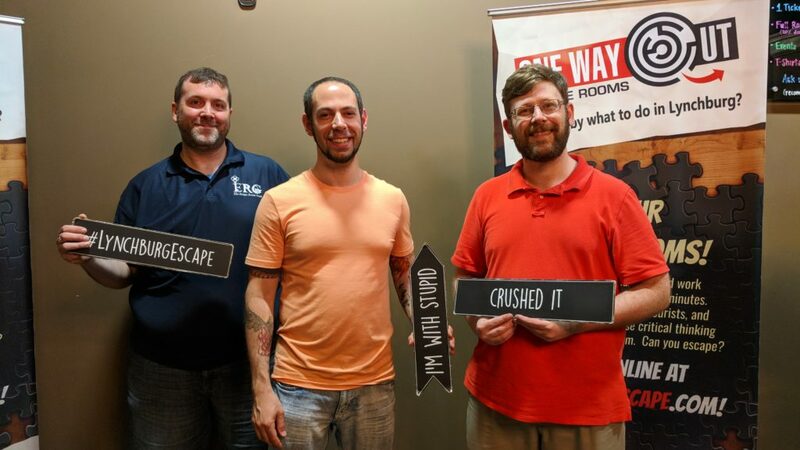 Other than that, there were only one or two puzzles that we did take some time to figure out, even though they were not terribly difficult, but made good use of the room and the decor. If I had to rate the puzzles on a one-to-ten scale of complexity, which I don’t but I’m going to anyway, I would put them somewhere in the range of 4-8. Rating: 8.5/10 We were doing this room with only three people, so we were busy from the very beginning. I wouldn’t say that the puzzles themselves were overly difficult to solve… once you figured out where they were. I think that was the hardest part of the room. Some of the puzzles did take a team working on them, just for the sheer volume of work it took to come up with the solution. There were others that could be solved on their own very quickly. I think we did a good job at tackling the easier puzzles individually, while partnering up to attempt to solve the harder ones or to double-check the work of a teammate. This turned out to be a somewhat linear room. It started off with a good spread, and we could all move about the room pretty freely, but 15 or so minutes in we found ourselves either grouping together to help on puzzles or actively trying to solve the same thing. There were multiple times where we would break off and try something else, but once you found the information regarding the death of the person haunting this room, that’s when everything comes together and you now need to figure out who did it and when. The decor was spot-on. I really felt as if I was in a creepy, dark basement during a thunderstorm. The ambiance itself is enough to warrant checking out this room, but considering its time is as limited as the patience of the spirit haunting it, you are better off seeking it out sooner rather than later. Rating: 9/10 I don’t know what we expected when we walked into the room. It was well decorated to look like a basement in an old house that has some renovations going on (that you uncovered during your overall investigation). Lots of creepy old toys and decorations added to the ambiance. I think the room flowed really well from beginning to end. There were multiple paths where you could work independently before it went linear to solve the final puzzle and provide you with the solution. One thing I enjoyed was that the room was very, very subtle in how it presented the clues. Nothing really screamed out “LOOK HERE” and then was solved in 20 seconds. You actually had to work to solve some of these puzzles and figure out how the solutions wrapped up into the overall mystery. I didn’t see anything out of place here either, so everything fit the mission or the story. And, I enjoyed the different spins on some of the puzzles we’d seen elsewhere, so there was a bit of uniqueness to the design of the room and the construction of the puzzles as well. Other than the 5ish minutes I had to spend on that one puzzle doing laps around the room, I enjoyed the experience. There were points in the room that I was really excited to be there, and others where I started to get frustrated simply because we couldn’t actually find the next damn puzzle to solve, but that is a point in favor of the room design. We had the same GM for all 3 games that night and she was equally helpful throughout the evening. Kristina was good and mostly left us alone until we asked for that one damn clue. If I recall correctly, we only needed one clue to remind us where to find something that was obstructed by the solution to an earlier puzzle. Yeah, it was helpful. We looked all around the room multiple times before getting the clue, and then promptly knew where we had to go and what we had to do. Rating: ?? I’m going to give this a 3 because we should have figured out where to use the equipment, and do a bit better job at uncovering where the puzzles were actually located. Final Thought: If you are in the area and are reading this, you should go book this room and do it next week because it’s closing down on July 29, 2018. This room was a lot of fun, and was challenging due to the very good room design in hiding the puzzles in plain sight.